AirAid SynthaMax QuickFit Air Intake 02-08 Dodge Ram All AirAid SynthaMax Quickfit Air Intake 03-08 Dodge Ram 5.7L, AirAid SynthaMax Quickfit Air Intake 03-08 Dodge Ram 4.7L, AirAid SynthaMax Quickfit Air Intake 03-08 Dodge Ram 3.7L, AirAid SynthaMax Quickfit Air Intake 03-08 Dodge Ram 5.9L, AirAid 300-125-1 [AirAid 301-125-1 Intake System] - $302.95 : 3rd Strike Performance, Your Source for Late Model MOPAR Performance Parts and Accessories! AirAid SynthaMax QuickFit intake systems are specially designed to work with your factory cold-air inlet and filter housing, while providing your engine with increased airflow and horsepower. These bolt-on systems use your stock location, clamps, and clips. Their intake systems will eliminate the restrictive air box lid and stock paper filter. 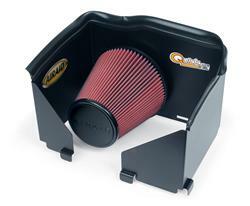 AirAid SynthaMax QuickFit intake systems include a SynthaMax premium non-oiled filter, which features high-tech filtration for superior output and long-lasting quality. Dozens of models are available for fitment on specific vehicle applications.